I swear these challenges at the Sisterhood go faster each time. Today is the last weigh in for the Shrink into Summer challenge. When I posted my first Weigh in Wednesday on April 1st, I weighed in at 143lb. This past Saturday when I weighed in, my eyes were astounded as I saw something I had not seen in a very looooonnngggg time. A number that began with 1 & 3. Yes, my bloggy friends I saw 139.5 on my scale. Hoorah!!! I'm officially in the healthy weight range for my age and height. 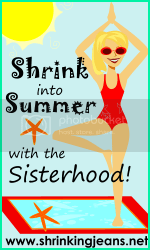 So this week I bid farewell to the Shrink into Summer challenge and also to 3.5lb that I loss over the weeks. Now I only have 4.5lb to go to reach my final goal weight. Oh my gosh, that's excellent!! Great job! I'm at 143.8 now, I cannot wait to get to the 130s!! CONGRATULATIONS!!! I long to see the 130s again and I'm not too far away! I'm so proud of you, Mel!! !